I had an opportunity to attend a Mobility BU hosted training at Cisco HQ in Santa Clara. This training covered Hyperlocation, Connected Mobile Experience (CMX) and the Enterprise Mobility Services Platform (EMSP). I had been looking forward to this ever since I received the invite, having invested time into the solution as early as 2013. These technologies are unified in purpose in that each of them have a role to play in transforming the end-user experience and enabling businesses to engage with their customers in new and interesting ways. As one of the Wireless Field Day 8 delegates, I had an opportunity to see the Hyperlocation Module (HALO) up close and personal, however we never got a chance to actually play with it. For those interested, I wrote a detailed blog post about the technology after the WFD8 event. This time around however, we not only got to spend time talking through the technology and its use cases, we actually spent time playing with it in the CMX Lab at Cisco HQ. Seeing hyperlocation in action is impressive and the accuracy was within one meter as advertised. While the location accuracy is great, what is really intriguing is the network is aware of where the user is rather than relying on the user to interact with a beacon or something similar. I had the opportunity to walk around the floor space with an iPhone6+ and watch its movement on the screen. The response was impressively crisp for being 100% Wi-Fi based, but not quite as smooth as beacon-based movement tracking. This distinction is important though as beacons do require a user to be using their app to adequately engage, where as hyperlocation is simply the network being aware of the device and its movement inherently. Cisco’s CMX software works by detecting the presence of a device on the wireless network. 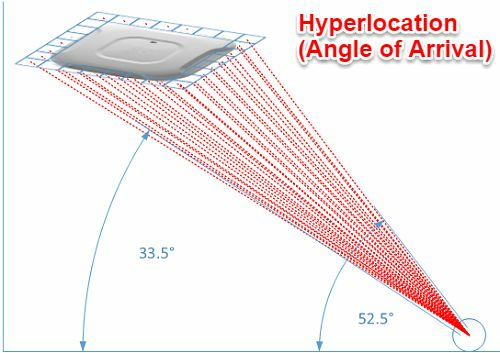 Presence is simply the device being local to a given access point, it does not necessitate location, however location is an option and can be accomplished through standard triangulation or by the addition of the HALO module. Connection is the process of getting the user to opt-in through captive portal, SMS, social media, or mobile app. Some organizations are challenged with mobile app adoption so alternatives are a welcome addition. Lastly once the user is connected, engaging with them in new and innovative ways is the goal of the platform. Playing with CMX at the Cisco lab was fantastic—we walked around with various devices ranging from phones to Ava the telepresence robot who drove herself around the lab. Our movements generated a ton of data for CMX which we could then use to send notifications, trigger an action, etc. The reports and analytics offered around these actions are simple to navigate and provide powerful insights for organizations. EMSP is an open, cloud-hosted mobile application platform which provides an intelligent way to deliver customer engagement and is used with CMX to leverage location based services. Upon location acquisition of customer, EMSP wifi-enabled, browser-based captive portal provides a mobile experience specific to the location of the mobile device user, who they are and what they’re doing. EMSP then provides event-based, actionable insights which enable improved monetization and conversion of customer from looking to buying, from general presence to engaged interaction. In addition, the EMSP solution includes a tool suite for rapidly and dynamically updating content for the context-aware mobile experience. With this in mind, EMSP simplifies and accelerates time to deployment. It has the intelligent hooks to act upon the insights provided by CMX location services to improve the client experience, influence behavior, solicit feedback and automate workflow. 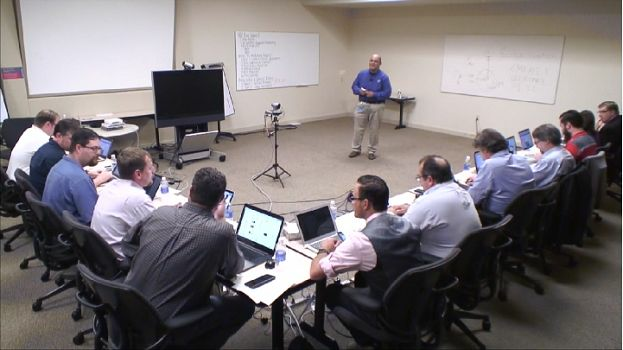 I had the opportunity this week to visit Cisco Systems with the the Wireless Field Day 8 crew this past week to discuss the updates to the Cisco location services roadmap. This space has been a passion of mine for a number of years and to see major advances in the last 12-18 months has really gotten me energized again about the possibilities that are out there. Cisco provided a recap of how we got to where we are today and I wanted to do the same to ensure that the concepts here are captured properly. 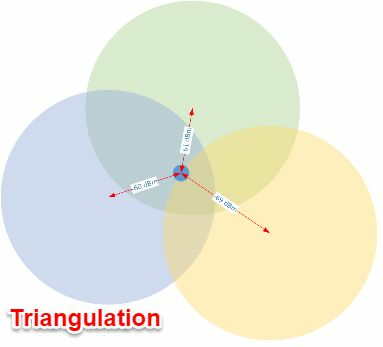 Location services use the triangulation concept to position a device within some probability of accuracy. In the example below, the object being tracked is roughly equidistant from the access points in the upper and left access points and a bit further from the right access point. As you may already know, under most conditions the best accuracy that can be expected is 3-5 meters and there is no certainty that the tracked client will be in a specific room as it could be on the other side of a wall, etc. This has lead to minimal adoption of location services as often this information simply isn't good enough to be useful. It's also important to note as Cisco mentioned in their discussion that for a packet to be seen by all three APs in this scenario, it must be a broadcast packet. On many devices, broadcast packets are becoming more uncommon while associated to an access point. This means that the refresh rate of this location information is slowing down, decreasing its usefulness further. 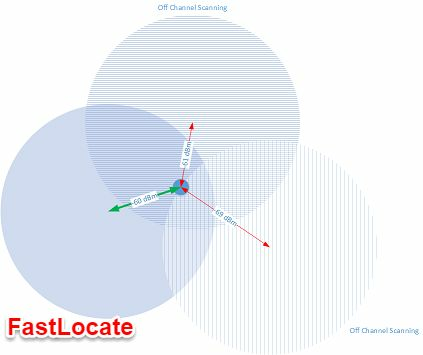 One of Cisco's recent innovations to assist this refresh rate issue is known as FastLocate. This uses data packets to improve the rate at which we see packets. Since data packets only exist between the client and the AP that it is associated (green arrow in the FastLocate diagram), the other APs have to go off-channel briefly to hear these packets as well. This process improves the refresh rate from approximately 1 frame per 60 seconds to 1 frame per 10 seconds. It's important to note that while this does not improve the actual location measurements, it does provide more data points which allows for better overall resolution and causes less "jumping" in which clients appear to teleport from one location to another. 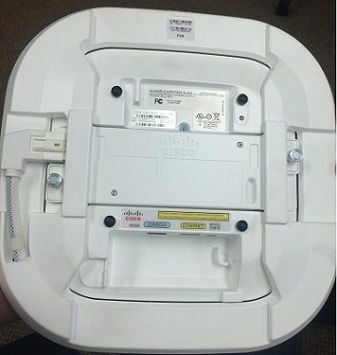 The HALO module was the highlight of the Cisco presentation for me as I had not seen one of these up close yet. The HALO module leverages a 32 element (16 2.4GHz and 32 dual-band 2.4/5GHz) phased array antenna that sits on a collar surrounding the access point and attaches via a special connector on the new wireless security module. 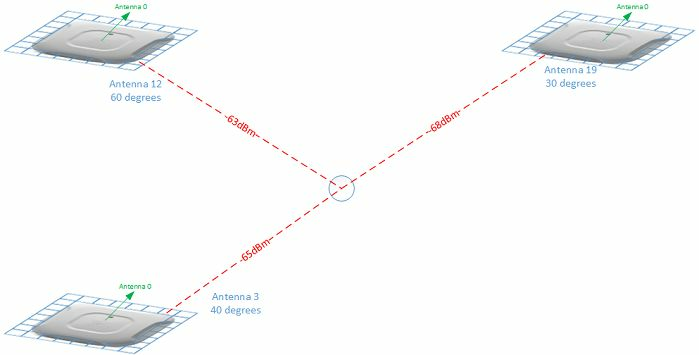 This array is comprised of directional antennas which enables far greater location accuracy and is truly the first real leap in wireless location accuracy in quite some time. Since each of these antennas are facing different directions and are all slightly located apart from each other, it is possible for the APs to calculate Angle of Arrival (AoA) in the wireless signal. This combined with the traditional triangulation allows for very specific accuracy down to approximately 1 meter, which is competitive with BLE capabilities. Further testing will be required to see if these claims hold up and if we can see actual room level (or better yet bed, etc.) accuracy, but I believe strongly that this will be the case in most situations. Currently this limited to associated clients only, but there is a near term roadmap for products that beacon on regular intervals such as RTLS tags. Tracking unassociated devices is of lesser priority right now, but is on the road map. Enabling an infrastructure with serious location capabilities isn't cheap at roughly $1000 per access point (MSRP), so the use cases need to be substantial. HALO is a premium engagement and location offering that will not be adopted by the masses, however those who can leverage it effectively stand to offer tremendous value to their customers, patients, stakeholders, etc. Hospital environments to be the single most valuable environment for HALO, especially after RTLS tags are added to the mix. This environment is highly mobile and ripe for disruptive location technologies that can automate work flow and enable meaningful interactions and engagement. 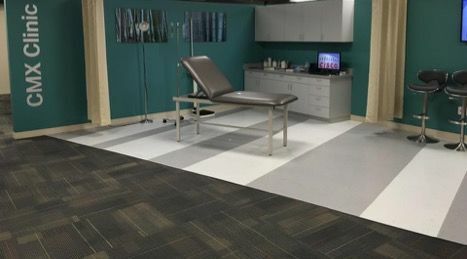 Hospitals today leverage multiple location systems that facilitate portions of work flow, however very infrequently are they integrated together well enough to gain additional actionable insights. There are a number of point products addressing nurse rounding, locating wheelchairs and beds, theft prevention (babies and assets), etc. Some of the "bleeding edge" use cases include playing a loved one's voice over IP speakers to coax an elderly patient back into bed or having a display cheer up a child who is battling cancer when they near the screen. In theory, this HALO module is enabling a world in which we know where every associated wireless device is down to a matter of feet, without necessitating RTLS tags. This opens the data floodgates for actionable intelligence at unprecedented levels. RTLS vendors have been selling their solutions for years to address these issues and while there are clear ROIs in most cases, it still doesn't get adopted due to significant cost and/or limitations for a single purpose system. HALO offers the ability to gain insight into numerous inefficiencies within a hospital and can improve any investment already made in tags and RTLS systems. More importantly a truly location-enabled work flow could facilitate meaningful interruption ensuring that nurses are only getting notifications when absolutely necessary and routing other requests to someone who is better positioned to assist a patient quickly. These use cases have been well defined over the years and HALO is an enabler to making these a reality. Integrated with Prime and the MSE, HALO can provide improved throughput analytics for the waiting rooms. I'd expect this to get down to individual care arcs in which an organization could track a single patient progressing through their visit and providing trends. This would provide feedback into the work flow optimization process and enable further analysis of the changes made to the work flow processes. There has been a lot of buzz around "mobile engagement" lately and as a professional in this field I can attest that there certainly are many options and the jury is out as to which is the best one at this point. I am a huge proponent of the Low-Energy Bluetooth solutions out there, however HALO may be the first "Wi-Fi only" offering that offers the ability to truly engage with BLE-like location capabilities. Organizations evaluating these solutions need to account for the care and feeding of a BLE-based solution as like many of the RTLS offerings there is a battery powered infrastructure that has to be maintained. One of the major limitations to the Low-Energy Bluetooth solutions is that they are almost exactly backwards from RTLS solutions in that mobile assets are required to interact with fixed (usually) assets. This typically means an app on a Smartphone (carried by a mobile user) is the typical mode of engagement and this is an active process. A few use cases of cropped up recently in which a BLE-beacon is strapped to a patient to monitor them as they move through an environment. To accomplish this the interaction points along the way require a tablet mounted to the wall to pick up on the patient's tag and initiate the engagement work flow. This reverse BLE-solution is somewhat innovative and solves a specific problem, however we need a world in which mobile assets are interacting with other assets on demand and relative proximity to each other should be irrelevant as long as I have access to the back end data. I believe that HALO is positioned to do exactly this as it evolves and in doing so will allow the use of Wi-Fi based geofencing capabilities indoor, reducing or possibly even eliminating the need for traditional fixed beacons. At the very least this will provide us new deployment options and can be combined with a BLE infrastructure to offer infinite interaction capabilities. The items above all point towards enabling the Internet of Things (IoT) and allowing real time interactions between devices to the betterment of the healthcare environment. An example of this could be the lifecycle of an infusion pump. These devices follow a predictable cycle in which they move from being clean through being attached to a patient and ultimately wind up having to be cleaned again before being released back to the care areas. In this scenario, alarms could be triggered by a device that has not been put in a maintenance mode and is following an unexpected path, possibly avoiding a dirty pump being brought to a patient, etc. 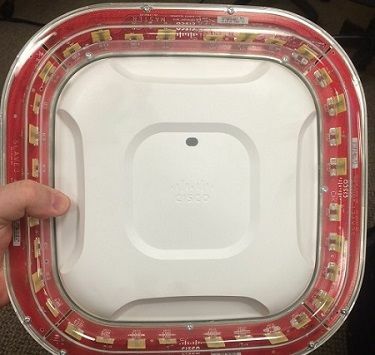 Effectively using HALO requires that the APs are mounted to the ceiling grid as they need clear line of sight. Density is expected to be at least one AP every 50' with each covering roughly 2500 square feet. Environments using smartphones, etc. will typically see smaller square footages per AP due to the requirements of those smartphones, so the density of these modules will be higher. Installations are expected to take longer due to specific needs around mounting locations. X,Y,Z coordinates need to be exact as well as the HALO module rotational orientation and alignment with antenna 0 of the 32 element array. These positions must be set in Prime 3.0 to provide proper location capabilities. Thursday October 1st marks day two of Wireless Field Day. Follow us live at http://techfieldday.com/event/wfd8/ and if you want to join in on the conversation, reach out to me or any of the other delegates as we can ask questions on your behalf. Follow us on twitter at #WFD8. I will be blogging about the event throughout the next two days, so stay tuned for additional information. Video recordings will be made available shortly after Wireless Field Day comes to a conclusion. Cisco enables people to make powerful connections--whether in business, education, philanthropy, or creativity. Cisco hardware, software, and service offerings are used to create the Internet solutions that make networks possible--providing easy access to information anywhere, at any time. Cisco was founded in 1984 by a small group of computer scientists from Stanford University. Since the company's inception, Cisco engineers have been leaders in the development of Internet Protocol (IP)-based networking technologies. Today, with more than 65,225 employees worldwide, this tradition of innovation continues with industry-leading products and solutions in the company's core development areas of routing and switching, as well as in advanced technologies such as home networking, IP telephony, optical networking, security, storage area networking, and wireless technology. In addition to its products, Cisco provides a broad range of service offerings, including technical support and advanced services. Cisco sells its products and services, both directly through its own sales force as well as through its channel partners, to large enterprises, commercial businesses, service providers, and consumers. Zebra Technologies Corporation builds actionable information and insight, giving companies unprecedented visibility into their businesses by giving physical things a digital voice. Zebra’s extensive portfolio of solutions give real-time visibility into everything from products and physical assets to people, providing very precise operational data not only about where things are, but what condition they are in. This allows business leaders to use data to make better, more informed decisions, respond, and ultimately, help businesses understand how they work, and how they could work better. Aruba Networks, an HP company, is a leading provider of next-generation network access solutions for the mobile enterprise. The company designs and delivers Mobility-Defined Networks that empower IT departments and #GenMobile, a new generation of tech-savvy users who rely on their mobile devices for every aspect of work and personal communication. To create a mobility experience that #GenMobile and IT can rely upon, Aruba Mobility-Defined Networks™ automate infrastructure-wide performance optimization and trigger security actions that used to require manual IT intervention. The results are dramatically improved productivity and lower operational costs. 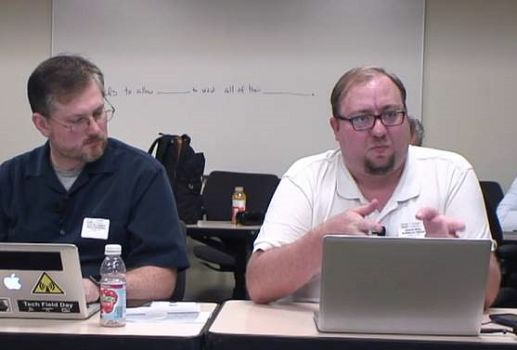 I've been watching the content published on Wireless Field Day ever since I had first heard about it late in 2011. The presenters have to be on point given their demanding immediate audience and the results are fantastic. The team is interested in real world performance rather than marketing spin. Going under the hood and digging into the inner workings of the technologies in a public setting is such a great way to build confidence in a product and it enables me to better set expectations for my customers when I am out educating them on the market. I recently went to the site to check out the upcoming event and found that there was interest in finding new delegates for Wireless Field Day, so I reached out and am so glad that I did. After a few discussions, I was officially offered a delegate spot for Wireless Field Day 8 and couldn't be more thrilled about it. For me, this is where the work begins. I am honored to be part of this group, but also feel challenged to step up and contribute like some of others in our great community do. Thank you WFD, I am excited and humbled by the offer and look to make this the best WFD yet. Tune in Oct 30-Sept 2 at the site below. © 2019 The Digital Edge. Technical blog sharing my thoughts on the state of the industry, especially as it pertains to location-enabling wireless, security and the Internet of Things. Posts and opinions here are my own and do not necessarily reflect those of my employer.